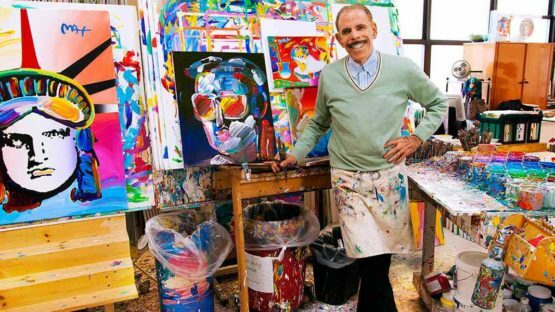 Peter Max is a German-born American illustrator and graphic artist, known for the use of psychedelic shapes and color palettes as well as spectra in his work. In 1938, Max’s parents fled Berlin, Germany, his place of birth, to escape the fomenting Nazi movement, settling in Shanghai, China, where they lived for the next ten years. In 1948, the family moved to Haifa, Israel where they lived for several years. From Israel, the family continued moving westward and stopped in Paris for several months— an experience that Max said greatly influenced his appreciation for art. Peter and his parents first settled in Bensonhurst, Brooklyn in 1953 where he attended Lafayette High School (New York City), where he was classmates with future actor Paul Sorvino. In 1956, Max began his formal art training at the Art Students League of New York inManhattan, studying anatomy, figure drawing and composition under Frank J. Reilly who had studied at the League alongside Norman Rockwell. In 1962, Max started a small Manhattan arts studio known as “The Daly & Max Studio,” with friend Tom Daly. Daly and Max were joined by friend and mentor Don Rubbo, and the three worked as a group on books and advertising for which they received industry recognition. Much of their work incorporated antique photographic images as elements of collage. In 1970, many of Max’s products and posters were featured in the exhibition “The World of Peter Max,” which opened at the M.H. de Young Memorial Museum in San Francisco. Max’s art work was first identified as having been a popular part of the counter culture and psychedelic movements in graphic design during the late 1960s and early 1970s. He is known for using bursts of color, often containing much or the entire visible spectrum. His work was both influenced by, as well as widely imitated by, others in the field of commercial illustration, such as Heinz Edelmann. Max’s repeated claims, varying in detail, to have worked on “Yellow Submarine” has been denied by the production team. Max is an environmentalist, vegan and defender of human and animal rights. Max currently lives in New York City.